The Lenovo Yoga 900 is an improved version of its predecessor that offers far more power in a sleek 13-inch form factor. The Lenovo Yoga 900 80MK0010US is an improved version of the bestselling 13.3-inch hybrid laptop the Yoga 3 Pro. 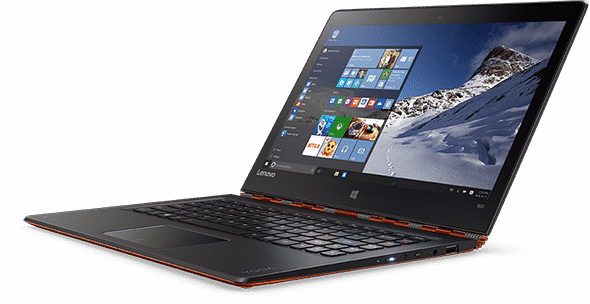 With an ultra low voltage Skylake i7 processor, 8GB of RAM and a 512GB solid state, the Yoga 900 will handle any day-to-day task with ease. The integrated graphics offers a great work and multimedia experience, but will only run older gaming titles on low to medium settings, with some classic titles running on high. The lack of an HDMI port will mean purchasing an adaptor to connect the Yoga 900 via USB Type-C to an external monitor or TV. The display is crisp and responsive, but at full resolution it does leave icons and fonts looking very small. Lenovo has crammed in the keyboard leaving some of the keys in awkward positions. Lenovo, a leader in the laptop-tablet hybrid market, impressed with last year’s Yoga 3 Pro. With its "watchband" hinge that rotated 360 degrees, the laptop combined innovative design with decent performance, making it one of 2014’s most intriguing Ultrabooks. Lenovo clearly listened to feedback about last year's high-end Yoga, keeping the excellent overall design but boosting the specs to match other premium 13-inch laptops.